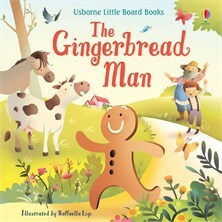 The Gingerbread man is a classic in our house and my 2 year old son loved the repetition of the main gingerbread man rhyme. It has very much helped him remember the rhyme and to even sing it back to us without being prompted! The accompanying illustrations are lovely and colourful, and the book is the perfect size for little hands.